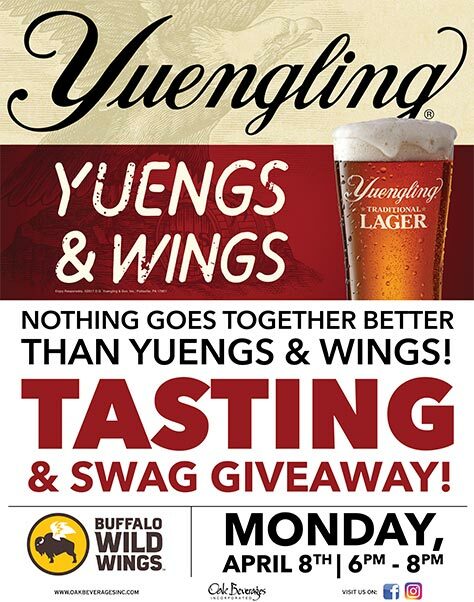 Buffalo Wild Wings Yuengling Tasting - Oak Beverages Inc.
Buffalo Wild Wings Yuengling Tasting Event, Monday, April 8th, 6pm – 8pm. Nothing goes together better than YUENGS & WINGS! Buffalo Wild Wings Tasting and Swag Giveaways! This year, Yuengling is celebrating our 190th anniversary with exciting announcements and events, including the release of limited-edition, 190th Yuengling Traditional Lager beer cans. These five commemorative cans pay tribute to Yuengling’s enduring history, and the entrepreneurial spirit and relentless determination that has made it America’s Oldest Brewery. The cans are collectors’ items, and Yuengling is releasing a new can design each month between December 2018 and April 2019. Posted in Featured Promo, Giveaways, Sampling, Tasting Event.